Spinal muscular atrophy with respiratory distress type 1 (SMARD1) is a rare autosomal recessive neuromuscular disorder that involves the anterior horn motor neurons. It is a disease with a poor prognosis presenting with progressive distal motor weakness and respiratory insufficiency from diaphragmatic paralysis followed by distal muscle weakness before 6 months of age. 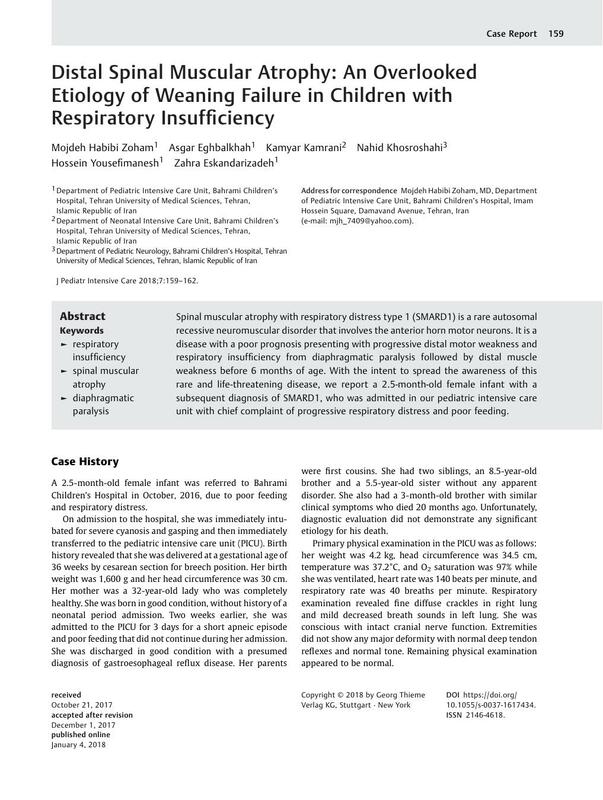 With the intent to spread the awareness of this rare and life-threatening disease, we report a 2.5-month-old female infant with a subsequent diagnosis of SMARD1, who was admitted in our pediatric intensive care unit with chief complaint of progressive respiratory distress and poor feeding.